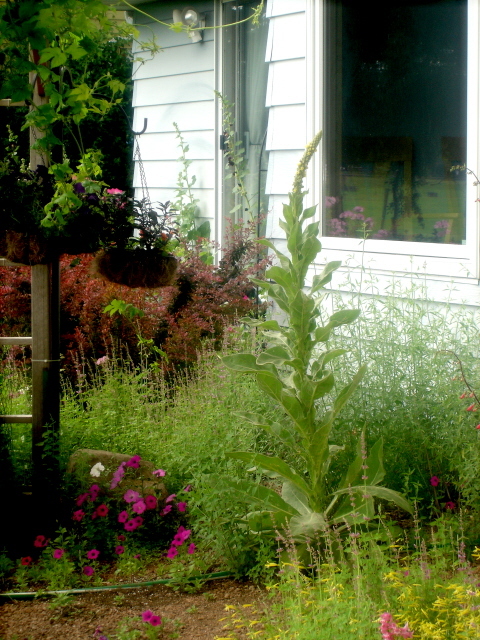 I'm told that our house sits on what used to be farmland not more than a generation ago, and mullein (Verbascum thapsis; common mullein, wooly mullein, flannel plant...you get the idea) is a farm weed that shows up here and there every season. I'm fond of this weed. The leaves are softer and silkier than lamb's ear (but to describe them as "a kind of Native American Charmin"? Eeuuww). Mullein in the wrong place at the wrong time is gangly, ugly, and yes, weedy. But sometimes it just shows up where, it turns out, it needed to be. This summer, it's next to the David Austin rose 'Graham Thomas', punching up the yellows in a mostly bronze-leaved bed, and helpfully obscuring the rose foliage that's already tattered and pitted with blackspot. In the early days of this garden, I sought out and planted the verbascum 'Helen Johnson', enthralled by the description that I'd read in Jamaica Kincaid's garden book. Her delicate buds were pretty, her dusky peach-salmon color unusual, and she didn't last more than one season. 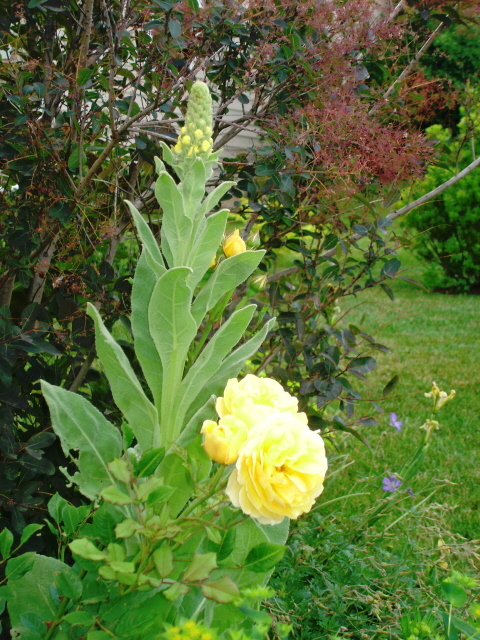 I think I'll stick to the great mullein, and look forward to its surprises in the seasons to come. I think that showed up in our front flowerbed once. I didn't know what it was, but it was amazingly big, for a "volunteer." I was pretty sure the rose in the photo was 'Graham Thomas', an old favorite. The two plants do go well together. Mullein also popped up in my IL yard, and I let it grow but don't think it returned. We were amazed at the huge stands along the railroad tracks when we took a train to the West Coast... that plant is tough! I noticed one site said another name for mellein was "golden rod". Since golden rod (ragweed) is abudant here in the south, it does not look like your picture at all. Any ideas on this?